Posted by Nick Prescott on 26 January, 2019. 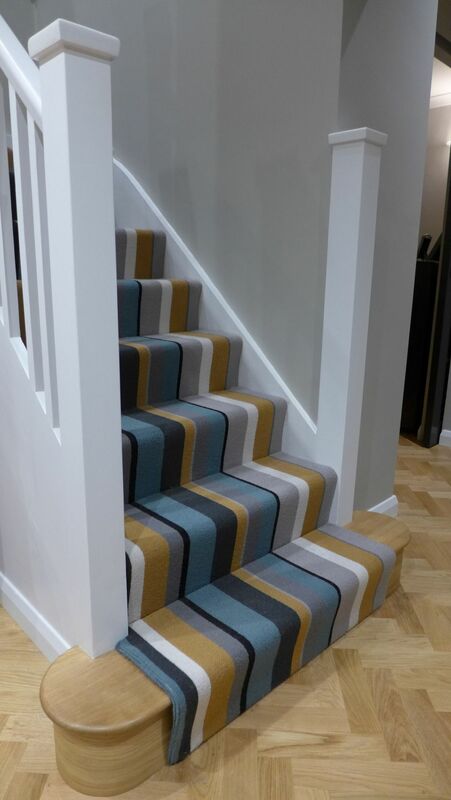 When you look at a striped stair carpet, you want the stripes to be continuous from tread to riser. But with a winding staircase, geometry causes the stripes to run out of alignment – trigonometry, and all that. Disaster! Indeed, we’ve seen carpets laid that way, and they look terrible. So how on earth did we achieve this, then? 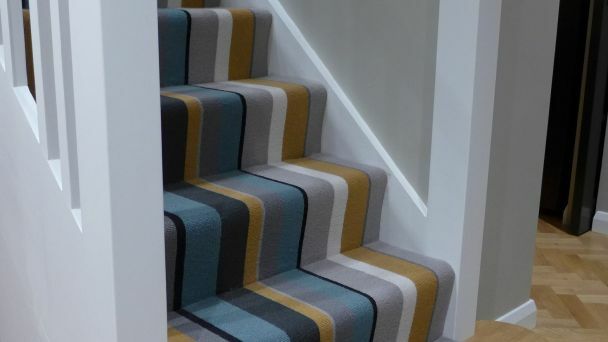 Can you line up THE stripes on a winding stair carpet? We found a flooring company that has perfected a method for lining up the stripes. It is a time-consuming task, so not cheap, but then the carpet itself was expensive, so you’d want it to look great. 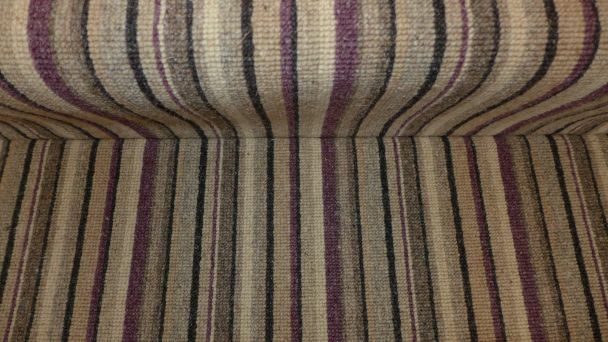 The carpet company was a long way from Bath so we asked our local suppliers whether they had the capability to do this. One was concerned about the effect on durability. However, our alternative company had done it before and had received no concerns from previous clients. The method is to cut along the stripes on the winder, bend the stripes so they line up all the way round, and then glue them in place. The carpet has underlay like any other, and you don’t notice the joins because the cuts are between the loops. Even on close inspection, the carpet on the winder looks just like that on the straight runs, and equally robust. 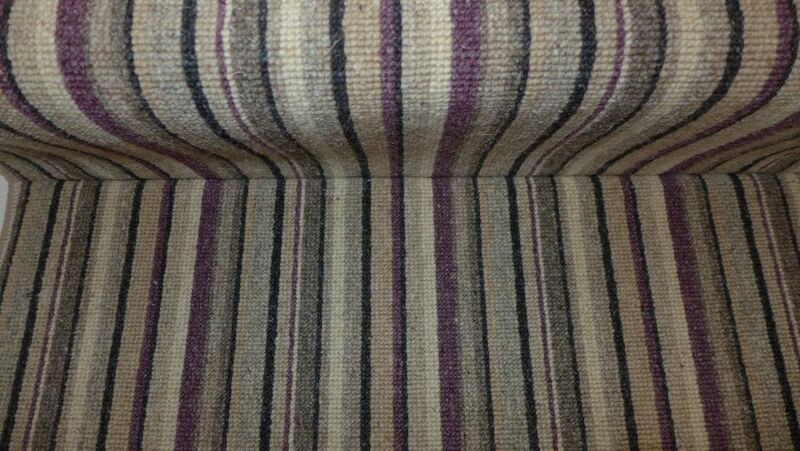 You can get away with some misalignment on narrow striped stair carpets because the deviation isn’t so marked. 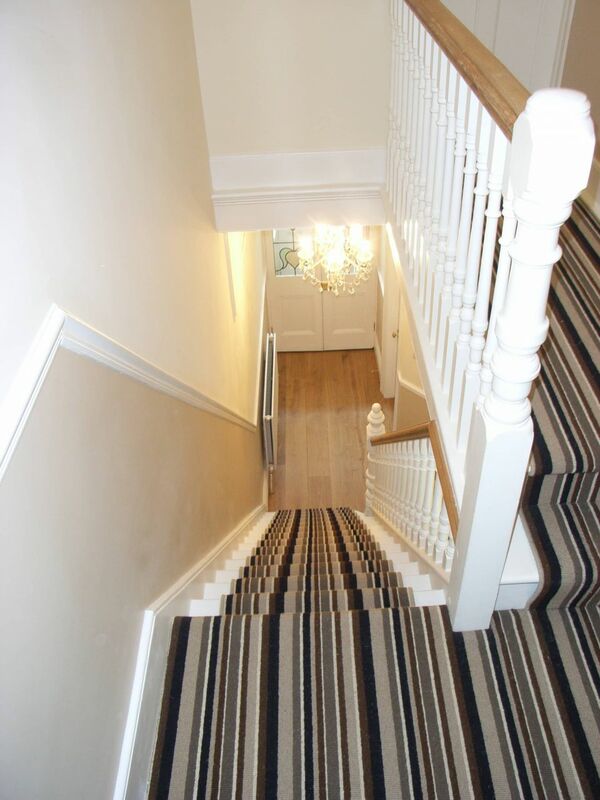 But with a statement, broad striped stair carpet, the deviation is very obvious. 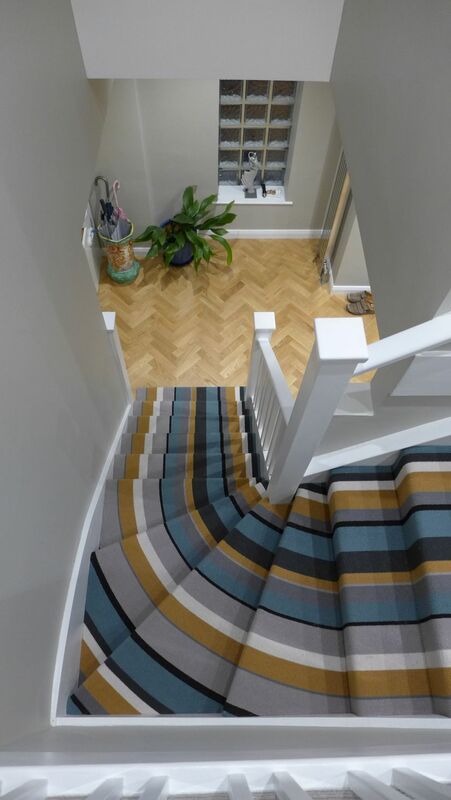 There’s usually a colour in the stripe that tones well with a timber floor, so we often fit oak in the hall that works well with the carpet. You can see more examples in our hallway design page. 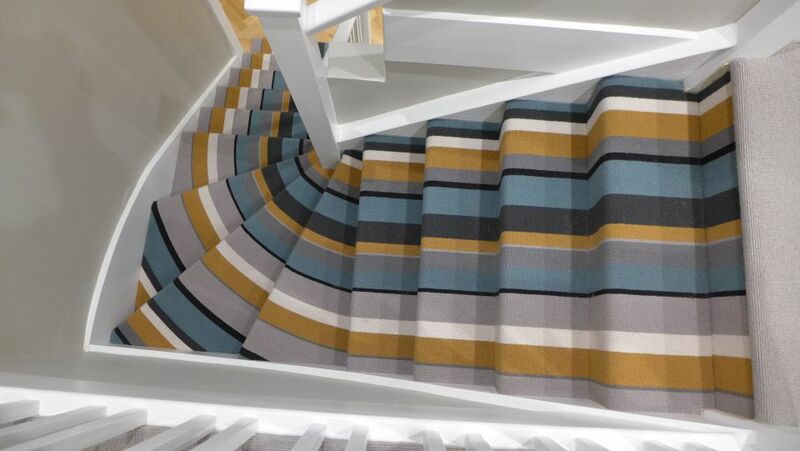 One final observation on striped stair carpets which is also true for striped room carpets. 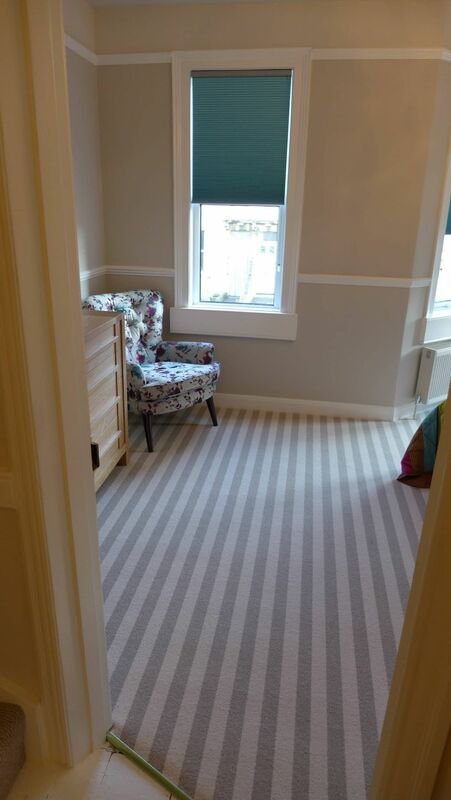 You can get stripes in loop carpets and twisted pile; looped pile carpets give a more satisfactory look because the loops are more regimented and the stripes are straighter (see bedroom below). 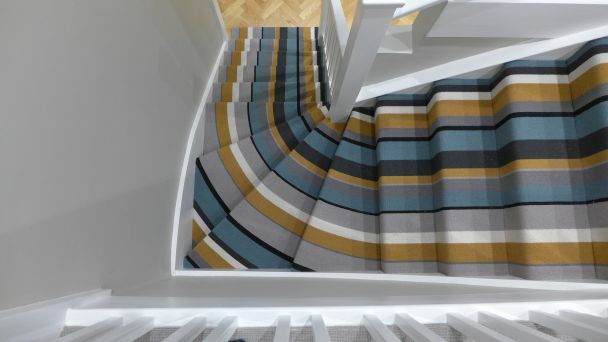 Because of the softness of a twisted pile carpet, the coloured tufts deviate more easily and so the lines are less straight.